« How Did Southern California Keep the Lights on During an Historic Heatwave? We Need to Know. Texas solar is growing very quickly: The new Solar Market Insight report declares Texas to be the fastest growing utility-scale solar market in the country. In fact, by the end of 2016, SEIA predicts the state’s total installed solar capacity will more than double. And within the next five years, Texas’ solar market will be second only to California’s (although, considering California has one-fourthof the solar power potential of Texas, we could eclipse the Golden State in coming years). Solar will make up nearly all of Texas’ new power capacity: The Electric Reliability Council of Texas (ERCOT), the grid operator for nearly 90 percent of the state, recently released a new long-term system assessment. 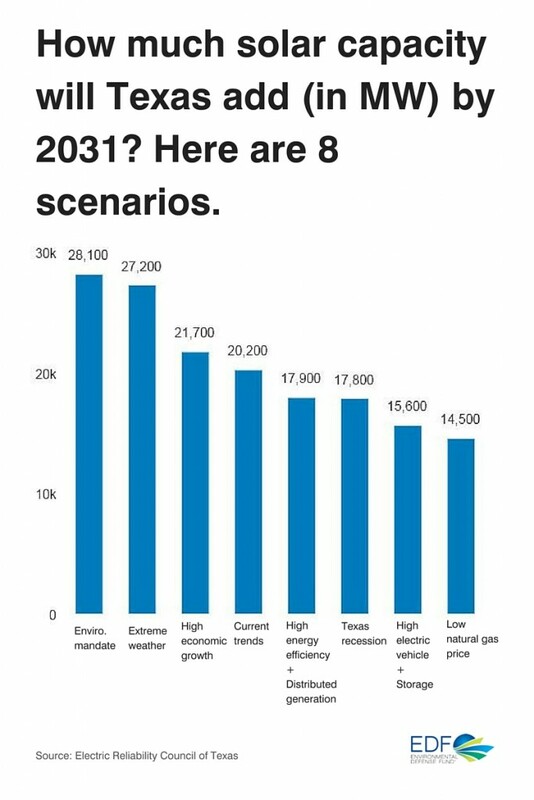 ERCOT evaluated the state’s 2031 electricity needs in eight potential scenarios based on trends and forecasts. For example, one scenario is the continuation of low natural gas prices and another reflects high economic growth. Solar was the common denominator in all eight of the scenarios: This clean energy resource represented nearly all of the new capacity in each one. In other words, the grid operator predicts that – in all foreseeable future circumstances – a lot more solar is coming online in the state. Moreover, the range varied from a low of 14,500 MW to a high of 28,100 MW, or approximately 25 or 50 times what Texas has installed today. Finally, if electricity generation capacity other than solar is added to the mix, it will be a combination of wind and natural gas, not coal. Texans agree on solar: A recent poll from the Texas Clean Energy Coalition found an overwhelming majority – 85 percent – of the state’s voters want to increase the use of clean energy (including solar) to generate electricity. Even better, both sides of the aisle are on board: That group included 78 percent of Republican respondents. Increasing the use of low-carbon solar energy has myriad benefits, starting with health. For example, decreasing harmful carbon pollution can prevent heart attacks, asthma attacks, and premature deaths. And a healthier Texas means fewer missed days of work and school, and less strain on our healthcare system. Second, solar panels use little to no water to produce energy, unlike coal plants, which require copious amounts of water for cooling and treatment. Texas has received a lot of rain this year, but another drought is always right around the corner. And, in a state with explosive population growth, saving water through solar energy could greatly alleviate water woes. Finally, solar energy’s success goes hand in hand with job growth. According to the State Solar Jobs Census, Texas was sixth in the nation with a total of 7,030 solar jobs in 2015. That’s already a formidable number and we’ve barely begun to scratch the surface of our sunny potential. For evidence of possible growth, California – which, again, has less solar power potential than we do – has 10 times as many solar jobs as Texas. These new reports show how fast and by how much Texas’ solar market is taking off, and polling confirms the growth is in line with what most of our voters want. Texas’ strong sunshine may get tiresome in the summer, but it’s providing us with cleaner energy that’s lowering pollution, saving water, and creating jobs. To me, that’s worth the heat. 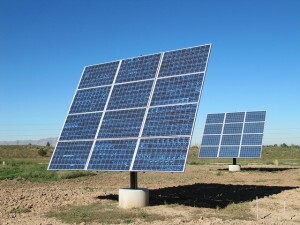 This entry was posted in Energy-Water Nexus, Solar Energy, Texas. Bookmark the permalink. Both comments and trackbacks are currently closed.